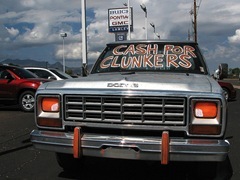 There is no doubt that the Car Allowance Rebate System, or “Cash for Clunkers” program has proved to be popular with American car buyers. So popular in fact, that it ran out of cash within the first six days of processing claims. This news got me thinking about the program in a more systemic way. Whether you think of the program as a stimulus for the economy or the environment, it cannot continue to operate without funds. Congress had to quickly approve another $2 billion for the program when the initial $1 billion appropriation was exhausted in less than a week. The rebate fund lacks an inflow of cash to offset the outflow of payments. I wrote about a STELLA model of a self-financing program to promote cleaner vehicle sales in May. The “Feebates” model uses fees charged on sales of vehicles that have high pollution rates to finance rebates for cleaner vehicles. I asked the Feebates model author, Andrew Ford what he thought about “Cash for Clunkers”. He sent me an article he co-authored with Todd BenDor titled “Simulating a combination of feebates and scrappage incentives to reduce automobile emissions”. Basically, the article describes a feebates model with a “cash for clunkers” type of rebate added to promote scrapping older vehicles. The article was published in the journal Energy, 31(2006), 1197-1214. Mr. BenDor was kind enough to send me the STELLA model so we could publish it to the web with isee Netsim. We thought this would be a great way to start some discussion around the Clunkers program, public policy and using simulations to facilitate decision making. Click here to run the simulation online. Can you design a policy that stimulates the economy and reduces emissions? This simulation uses fees to fund the program instead of deficit spending. What other sources of revenue could we consider? Many states levy a “sin tax” on tobacco and alcohol. How would the public react to fees on high-pollution vehicles?